Today is a gorgeous day in Washington, DC. I’m on my first walk in many weeks after the bitter cold blew through, plus a week in North Carolina. 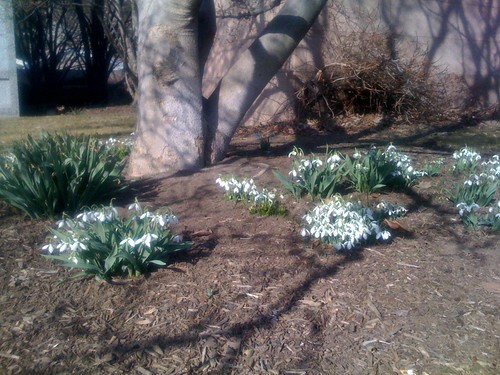 I also noticed the snowdrops blooming at mom’s house. I planted a bunch of bulbs the fall before our wedding. These little lovelies bloom way before May. But they match Alice, my everday china, which is a good a reason as any to toss a few bulbs in the ground. A crowd was gathered at Ford’s Theater this morning. Lincoln turns 200 tomorrow. So DC is full of excitement with promises of spring. I feel the excitement, too. The rest of my February is packed with lots of social activities and projects. I had a great time in NC catching up with my friends. I picked out fabrics with Jeannie and Lia. I found some fabric to recover my chair. And I registered for baby gifts. It was like super speed nesting, because I wanted to do everything that required a car while I was in Winston. I am ready for taking things at a tad slower pace. So lots to add to the blog this week, including the continuation of the stroller story. That seemed to stir up lots of comment activity. And my anonymous Bugaboo heckler is taking us stroller shopping this weekend if he is not too mad at me for turning on my comment moderation. I can’t wait for the heckler’s identity to be revealed.